Jalal-ud-din Akbar was one of the greatest Mughal rulers, who fought several big battles and brought about many changes in his court during his rule. His rule was so great that history textbooks in India now laud his tales, his work and mostly importantly, his architecture. During Emperor Akbar's rule, his empire witnessed some of the best monuments that were categorised as Mughal style of architecture. We are quite aware of his son Shah Jahan's mesmerising construction of Taj Mahal and more, but this article is completely dedicated to Akbar's stunning works of art. Here are the monuments you must visit that were built during Akbar's reign. The magnanimous Agra Fort used to be the main residence of the Mughal emperors till 1638. The glorious fort was declared as a UNESCO World Heritage Site due to the architectural brilliance of the walled fortress. The fort is a joined effort of many rulers; however, it was Akbar who reconstructed the ruined fort using bricks and sandstone. He used nearly 4,000 builders for 8 continuous years to complete the structure. In order to commemorate the victory over Gujarat, Akbar built the magnificent Buland Darwaza at a distance of 43 km from Agra. It literally translates to the Gate of Magnificence and is supposed to be the world's highest gateway. This classic example of Mughal architecture is made of red and buff sandstone and is exquisitely decorated using white and black marble. Apparently the construction of this beautiful structure took 12 years to be completed! This mesmerising palace built in Fatehpur Sikri was the residence of Akbar's wife, Mariam. In fact, the whole city of Fatehpur Sikri was built and established by Akbar. Encircled by stunning gardens, the palace has a rich red hue that is eluded from the red sandstone used in its construction. Another legend believes that the palace was built for Jodha Bai, also one of Akbar's loving wife. Therefore, the palace is often referred to as Jodha Bai's Palace as well. The palace has a beautiful painting of Lord Krishna in the premise. 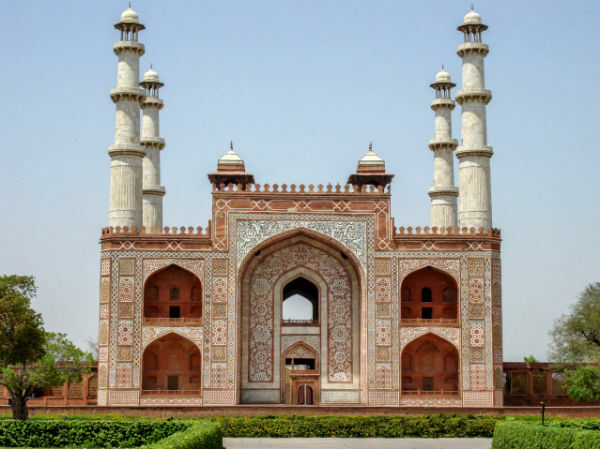 Although the construction of the tomb was completed by his son Jahangir, Akbar's tomb was entirely planned by Akbar himself, along with choosing the ideal site for it. It is located in Sikandra, which is a suburb of Agra. It is an architectural masterpiece of the Mughal Empire. The tomb is a pyramid made of four tiers and is constructed out of red sandstone and white marble. A visit to Akbar's tomb is a must in order to see intricate detailing of the carvings and paintings made on the ceiling and entrance of the tomb. During the rule of Aurangzeb, the tomb faced heavy blows from the Jats, who looted all the jewels and riches of the tomb. The beautiful fort of Allahabad nestles on river Yamuna, the point where it meets river Ganga. Built by Akbar in 1583, the fort has majestic, high towers and beautiful galleries in the fort. Currently, only part of the fort is allowed for visitors while the rest is under the army.